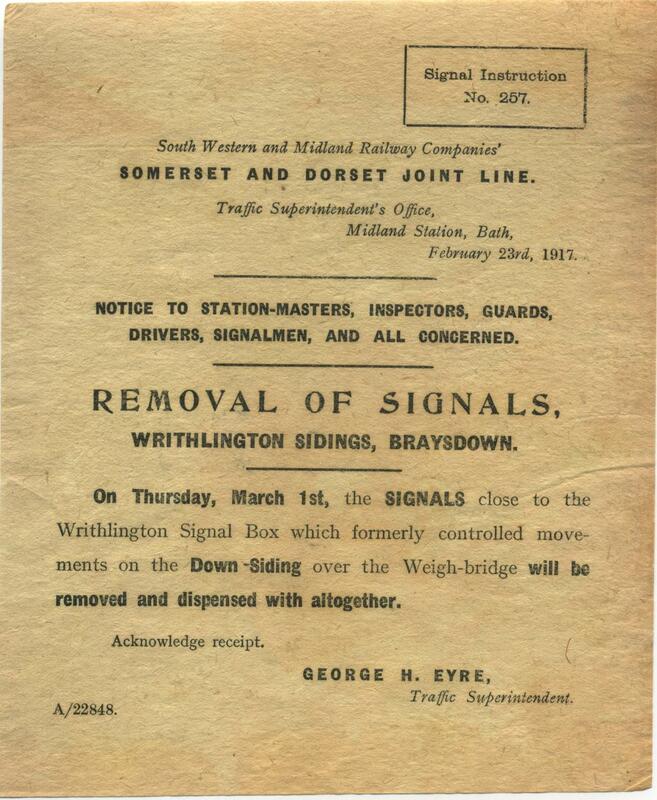 This page provides some background information about the Signal Instructions issued by the former Somerset & Dorset Joint Railway (S&DJR), and an Index to known Instructions. 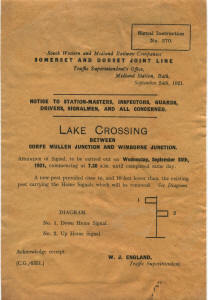 The S&DJR issued Signal Instructions to its staff with information about alterations to the signalling installations on the railway, and quite a few of these have survived. It would appear that these Instructions were numbered in a single consecutive series starting from 1, which was issued in late 1876. 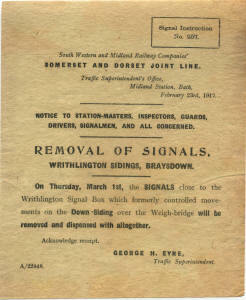 The latest known Signal Instruction is No 393, which was issued in December 1942, but it is probable that the S&DJR continued to issue its own Signal Instructions until the creation of British Railways in 1948, after which the Southern and Western Regions of British Railways issued their own notices. Some Signal Instructions were very simple, perhaps just a short paragraph to advise (say) the removal of a crossover, whereas others were more complex and might well include small diagrams of (say) new bracket signals etc. However it is clear from the content of the surviving Signal Instructions that they did not cover every type of alteration to the signalling infrastructure, in particular there are very few references to the change of equipment inside signal-boxes. It would appear that the Signal Instructions were aimed more at staff such as drivers and guards etc who would need to be made aware of changes such as the installation, relocation or removal of signals etc. 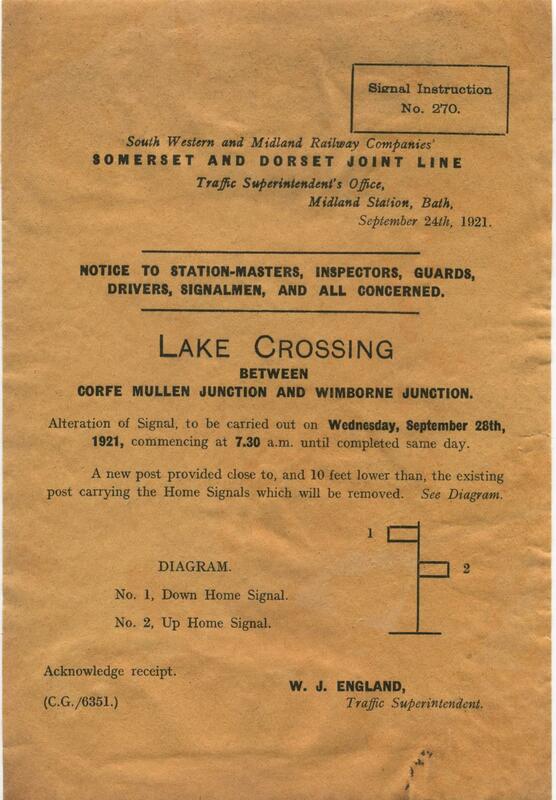 Some of the Signal Instructions do not relate to actual S&DJR locations, but to places on the former London & South Western Railway such as Poole, Wimborne etc through which S&DJR trains would pass on a regular basis. 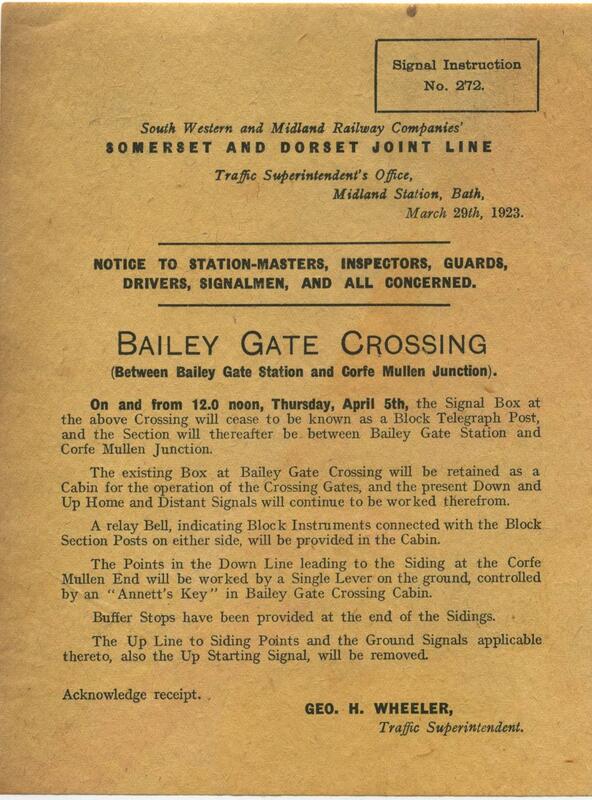 The majority of Signal Instructions related to forthcoming alterations and gave the date when the work would be done, but a few described work which had taken place. Although the work dates quoted in the Signal Instructions are used elsewhere in RailWest when discussing S&DJR signalling, it is impossible to be certain that the work actually took place on the exact specified date, as some delay may have occurred. There is one known example of a Signal Instruction which was issued to cancel a previous Signal Instruction, but it is possible also that delays or cancellations were notified by other types of operational notice. It should be noted that in many cases the work described in a Signal Instruction might have been spread over several days of preparation, the quoted date being the day when the alteration would be completed and the change officially brought into use. An Index has been compiled of all S&DJR Signal Instructions known to the author. 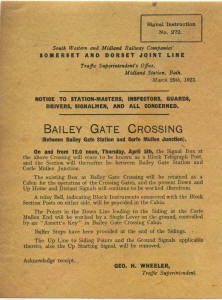 Many of the Signal Instructions listed in the Index are held in the Archives of the Somerset & Dorset Railway Trust (S&DRT) (which are now in the custody of the Somerset Heritage Centre and catalogued under their reference A/CWO/12/1/5), whilst others are in various private collections. Some entries are based on information recorded by other researchers and have been marked as 'unconfirmed' where no copy of the official Signal Instruction has been sighted. The 'No' is the identification number of the Signal Instruction. The 'Issue Date' is the date when the Signal Instruction was issued (where known). The 'Location' is the place at which the work will be done, identified usually by the name of the relevant signal-box or ground-frame. The 'Subject' is a brief description of the nature of the work to be done; any unconfirmed details are given in italics. A hash symbol '#' denotes a Signal Instruction which exists in a private collection. A dollar symbol '$' denotes a Signal Instruction for which information has been recorded by another researcher but no official copy has been sighted. The author would welcome information about any other surviving S&DJR Signal Instructions which are not listed in the Index. Please send details by e-mail to RailWest, ideally with a copy of the actual Signal Instruction. With acknowledgements to Chris Potts, the S&DRT and the late Peter McGhie for information from their collections.